Dr.Cindy’s Advice: Good, old-fashioned, FAT, hardcover, print dictionaries are the best. There’s no doubt you NEED a dictionary. Next to your teacher, your dictionary is the most INVALUABLE RESOURCE you have. That means your dictionary should become your very BEST FRIEND. You should use your dictionary frequently and with INTEREST. That means you have to LIKE your dictionary. Therefore, your dictionary needs to be of the BEST QUALITY. You need to learn HOW to use your dictionary properly. FIRST, look up any word you don’t know in an ENGLISH-ENGLISH DICTIONARY and find out what the word really MEANS. Be sure you are looking at the right word form. In other words, if you are looking for the definition of a verb, do not start out by looking at the meanings listed under subject because that will make it very difficult to understand the word in the context you are looking for it. After you have found the right meaning for your particular case, now look at how the word is used in all its OTHER word forms (i.e. subject, verb, adjective, etc.). This is generally an INTERESTING task and you will be surprised at how many other meanings there are to the word and how FLEXIBLE English words are. Now you must try to decipher the ROOT MEANING of the word. In other words, try to figure out what the various LITERAL AND FIGURATIVE MEANINGS have in common. If you are good, you should only need a few words, albeit the right words, to indicate what the word really means. In other words, with these few words, you should be able to DERIVE the other meanings of the word the next time you meet it in a completely different context. Initially, this takes a bit of effort on your part, but the payoff is enormous because it is very easy to use one little English word in a myriad of ways. 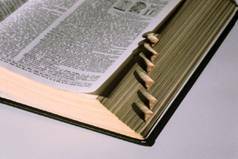 NOW, and only now, should you refer to a German-English dictionary to find the right translation of your word. In fact, you can skip this step entirely if you like. However, most students feel compelled to slap a German translation onto every English word they meet. The danger here is simple. Because German is such a specific language, it is HIGHLY likely you will slap on such a narrow German translation onto your English word so that you will not recognize this word when you meet it in a different context. In fact, if you use a German-English dictionary first, your chances of picking the WRONG translation are very high because there are so many definitions to each English word to choose from. Even worse, you will have NO IDEA what the word really means, and you will NOT be able to either UNDERSTAND or USE the word in a different context. This is a FATAL FLAW that will keep you from improving your English. DON’T DO IT. Dr. Cindy’s advice is to get a good, old fashioned, FAT dictionary in hardback, print form. By fat, I mean, DO NOT get some specialized “Power English”, or “Taschenwörterbuch”, or “Schulwörterbuch”, or “Business English”, or “Marketing English” dictionary, or any of the other thousand specialized dictionaries out there. They are amazingly inadequate. You need to get the biggest and fattest dictionary you can lay your hands on. There are only a few very good dictionaries out there so be sure to get the right one. It’s a LIFETIME INVESTMENT, so get the right one. Remember, it’s going to be your BEST FRIEND, so choose it with care. “Bah humbug”, you will say. “I will just go to the internet”. No doubt, there is increasing competition to have resources online. Each site has its pluses and minuses. Several sites have to live with annoying and distracting advertising. The best versions are pay for sites. Several sites are incomplete. If you choose to use online dictionaries, you will most likely be forced to use multiple sites to find exactly what you are looking for. The more advanced your English, the more difficult it will be to find a satisfying site. Here is a list to some of the better Online Dictionaries, in the order of my personal preference. As I said, you will quickly find out that these sites all have their advantages and disadvantages. Therefore, get in the habit of using more than one site to get a complete understanding of the word. In the end, you will be happy to go to your hardcover, print version! Generally, these are the most COMPLETE versions and will not require you to go to multiple sources (unless you are paying for an unabridged, non-advertising, online dictionary)!